available at the Apple App Store. Along with its electronic musical instruments, Casio has been developing musical apps with the goal of providing the joy of playing music to more and more people. To date, Casio has released several apps that have become widely popular: Chordana Viewer and Chordana Tap, which automatically detect the chord progressions of songs; as well as Musical Practice Tool, a useful app for practicing a musical instrument or singing. 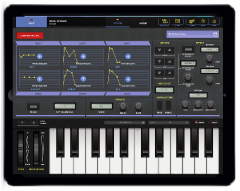 Now Casio has released the CZ App for iPad, an iPad app that recreates its best-selling CZ series of classic synthesizers and includes several all-new functions. CZ App for iPad allows up to four separate parts to be played using the original Phase Distortion sound source by Casio, and features 36 types of waveforms for producing a wide range of sounds. Users can play with a wide range of sounds based on eight basic waveforms and 28 combinations of those basic waveforms—for a total of 36 types of waveforms. The CZ App for iPad also features two digitally controlled oscillators (DCO), two digitally controlled waveform (DCW) envelopes, and two digitally controlled amplitude (DCA) envelopes. In each of these six blocks of parameters, users can make subtle changes to the sounds by setting temporal variations to pitch, timbre, and volume. Furthermore, users can visually check the modifications to pitch, timbre, and volume using the iPad screen while the sounds are being generated. Up to four virtual keyboards can be displayed on the iPad’s screen, each assigned to one of the four parts generated by the Phase Distortion sound source. Even a face-to-face keyboard layout is available, allowing two users to perform together with just one iPad. 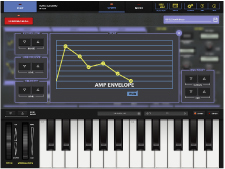 Music produced on the CZ App for iPad can be played using all kinds of MIDI-compatible musical instruments, such as Casio’s electronic keyboards, digital pianos, and synthesizers. CZ App for iPad is also compatible with Inter-App Audio and Audiobus, so it can connect to other apps compatible with Inter-App Audio and send audio data to Audiobus-compatible apps.